[2015 Update] Just a quick note that this flavor did finally make the transition to Non-GMO status, but it was a little hairy there for a bit as this was basically the last flavor I saw switch over. That said, the review below still stands for the most part. It's a nice flavor with a strong swirl, dense cake bits.... and a surprising lack of chocolate still. Just one of those things I guess. And now we have the ice cream! 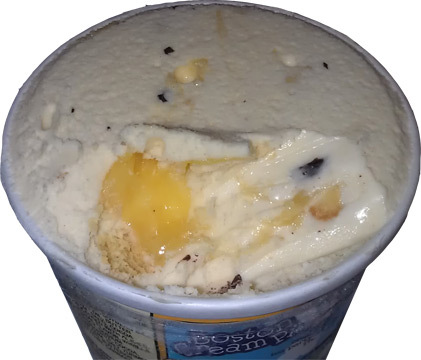 Behold the brand new [for 2010] Boston Cream Pie flavor from Ben & Jerry's. 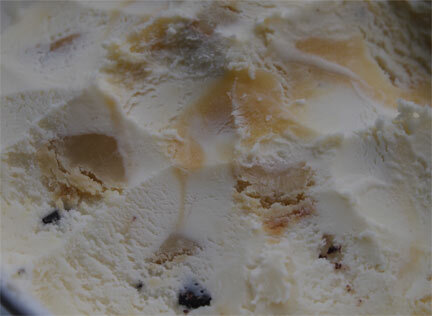 We have Boston Cream Pie Ice Cream with Yellow Cake Pieces, Fudge Flakes & Swirls of Pastry Cream. Living in Mass means Boston Cream Pie is available in every grocery store bakery, but to be honest, I'm not sure how popular it is outside of New England (or even Mass for that matter). Basically it's a thin layer of yellow cake, a layer of somewhat tangy pastry cream, another layer of yellow cake, and then a heavy (but thin) coating of fudge frosting on top. It's quite tasty if the right person makes it but I will admit that I have burnt out on it over the years. My boston cream experiences are now limited to my occasional consumption of the mighty boston cream donut, which is just a chocolate frosted donut with the same flavor cream inside. Ok, here's a nice close up of what's in store. 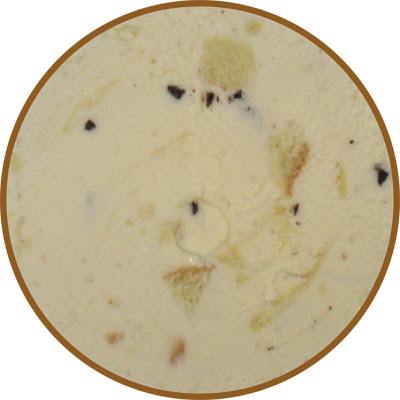 The base ice cream is an off white color. We have a nice scattering of some fresh looking yellow cake chunks. These bits could have easily gotten mauled in the ice cream process yet they look fresh and fantastic. That's a real nice touch and a great way to start things off. You can't really see the pastry cream swirls, but those are the shiny yellowish spots in the bottom right part of the picture. They are gooey, but not ooey gooey. Funny, I was expecting more fudge chunks ...I mean, the fudge is one of the best parts of a Boston Cream Pie, so I thought there would be a lot of fudge. Maybe they are further down. I dig in and YUP! this tastes like BCP alright! In particular, it tastes like the filling and the cake ...but where's the fudge coating? Uh oh, I wonder if I got a bum pint. This ice cream nails BCP on the money ....if said BCP is lacking it's fudgy frosting on top. Bummer. Now, let me give you a little warning. The filling in BCP is quite potent. It's not some mild filling that's happy to just flitter by your tastes buds on the way to your belly. No, BCP filling is a mighty thing that contrasts very well with the equally strong fudge frosting on top. The beauty of BCP is this contrast. Now you can't just have cream and a fudge frosting (mmmmm, sounds tasty actually). Instead, we add in some yellow cake to balance the whole thing out and you have a nice dessert. So, we have a potent filling flavored ice cream here. The nature of the filling also messes a little bit with the normal B&J texture, so be prepared for that as well. I think the cake pieces add to the presentation, and they are fun to scoop, but I'm not sure how much they add to the flavor. The filling vibe is already so strong that the pieces didn't seem add a whole lot flavorwise. Even if this pint hadn't been lacking in the fudgy factor, I still don't think this flavor is anything more than a once in a great while buy for me. If you like party cake flavored ice creams or really sweet ice creams, you will definitely like this. I'm thinking everyone else will just try it once and move on. One last thing, like any real cake, you might want to wash this one down with some milk when you are done, otherwise you might be tasting it for awhile. On Second Scoop: It's not often that I go and re-review a flavor, but the chance came up to test this one again and so I went for it. The good news is that I still get struck by that strong Boston Cream Pie flavor. I don't remember the cream filling being so prevalent before, but as you can see the puddle above, it's hard to miss. The bad news is that there still is barely any chocolate in this thing. How has this not been fixed by now? It's got a good flavor, I just can't condone the purchase of this one 'til they add more chocolate flakes. 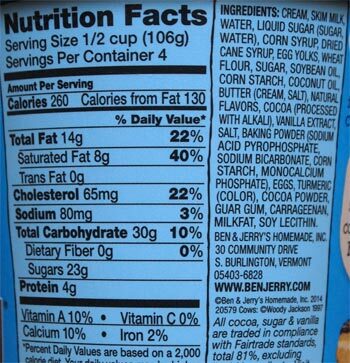 I wasn't a big fan of this Ben and Jerry's, the pastry cream swirl has an artificial flavor that lingers. 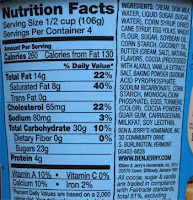 The Chocolate is a major ingredient in BCP -- you have to look far and wide to find the chocolate in the B&J's. Cheap, stingy chocolate flakes, and off flavor on the cream -- at a sale price of $2.79 - I was ripped off. Sorry for disagreeing so vehemently, Second Scoop - maybe you got a fresher batch than I did..
No need for an apology, I agree with your comments. Maybe you grabbed from the same limited flake batch that I did, and the filling flavor is more potent than it should be, so please don't apologize, this flavor could and should be better than this. 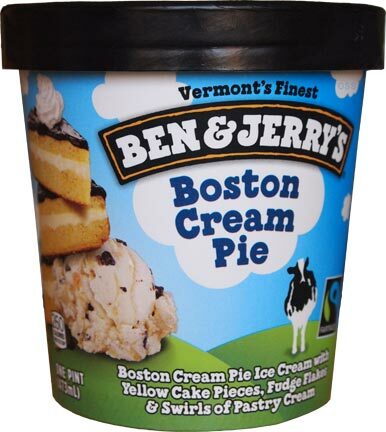 I liked the actual ice cream flavor, and I'm not a big fan of boston cream pie. You are right though, I could have counted the "fudge flakes" I found on one hand. I think more fudge flakes or just bigger chunks of fudge would have made it much better. I am from the Boston area so I had to give this a try. 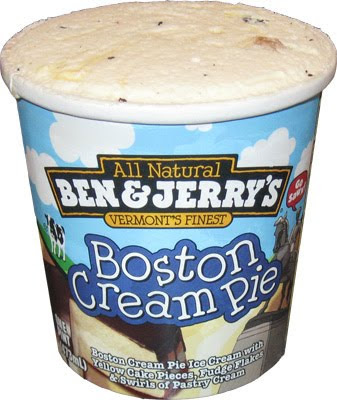 Although I liked it (it is hard to find a Ben and Jerry's flavor I don't like), it didn't really taste like Boston Cream Pie. I read all these reviews about how there weren't enough chocolate flakes but I disagree, because there shouldn't have been flakes at all. This should have had a FUDGE RIBBON - more similar to the frosting of the cake. Duh, Boston cream pie doesn't have chips of any kind!!!!!!! Won't buy again. excellent point Mike! I would totally settle for a fudge ribbon instead of fudge flakes because I just need some kind of fudge here, anything, please? ugh. just bought and tried it. it's gross. the taste is no good and the cake is mushy. zepp paid 2.79, i paid almost $4 on sale and i want to take it back. really. I would have liked it more if it wasn't for the grainy texture. They have chocolate bits to make up for the fudginess, but it doesn't cover it. I miss the Betty Crocker BCP mix so much! It was my requested birthday cake for many years. And I did have BCP on one trip to Boston, so I've savored the real thing. If this ice cream is the closest I can get (without making one from scratch), I can live with it. I'm thinking some chocolate Magic Shell on top would help. Are you guys serious? I LOVED this icecream. Might be my favorite Ben and Jerrys yet. For me though, I would have been happier with more cake peices. And the "pastry cream" is caramel. I was hoping for actual BCP cream. Oh well though. Ill buy more, alot more. This flavor is (terrible). Probably one of the worst B&J varieties I have ever tried. With hardly any chocolate, it is basically a sickly sweet strangely textured concoction. What a letdown. My mom just bought this and I LOVE IT!!!!! I'm kind of surprised most people here didn't like it because I think it's my new favorite flavor. I felt really dumb though because I have had Boston Cream donuts, but I've never had the pie...I actually didn't know there was a Boston Cream Pie until a few minutes ago...I feel very stupid right now hahahahaha! Sorry, I'm a kid. I love Boston Cream Pie---specifically Kroger's version of it. I love Ben and Jerry's, and am a MAJOR fan of cake batter ice creams, when done right. But imo, Ben and Jerry's doesn't do (vanilla) cake bases right and this was a prime example of that. I also didn't like Cake My Day either. And I don't remember what is was called but they had a yellow cake flavor with an actual chocolate frosting swirl and I STILL didn't like it. It's like they use cheap off-brand pound cake as the inspiration for these flavors, instead of their own unique recipe like with those glorious chocolate cookies. Yes Dubba. That's the one! A Duncan Hines yellow cake with chocolate frosting is one of my guilty pleasures and provides an ultimate nostalgia trip of when I was 6. That's what I was expecting, and it failed to deliver. I know you say you don't like cake ice creams because they're too sweet, so would you be willing to review Halo Top's Birhday cake ice cream? Even though it's reduced calorie, it's the best representation of cake batter without overwhelming sweetness. Unfortunately I can't handle erythritol, so the answer would be no for Halo Top.